First complete retrospective of one history's most enigmatic and influential electronic music composers on a deluxe 2CD set with extensive liner notes, exclusive photos and Zinovieff's own diary entries compiled by Sonic Boom a.k.a. Pete Kember (Spacemen 3). "Peter Zinovieff's innovations in the design of electronic music instruments have left an unquantifiable mark on the evolution of music technology touching the music of David Bowie and Aphex Twin to name but a few. 'The Electronic Calendar: The EMS Tapes' is the first complete retrospective of his earliest experiments in 1965 through to the dissolution of his studio and the bankruptcy of his company EMS Synthesizers in 1979. Born in 1933 to two Russian aristocrats fleeing the Russian Revolution, Zinovieff, a graduate of Oxford University, worked as a Mathematician in the Air Ministry following World War II and other "boring jobs in atomic physics”. During his time at Oxford he met Daphne Oram who taught him the fundamentals of creating music from splices of tape in her private studio prior to formation of the BBC's Radiophonic Workshop. The frustration of working with reels of tape led Zinovieff to ponder the idea of an electrically controlled studio, and in 1964 he sold his wife's wedding tiara to purchase the first computer housed on a private estate. Zinovieff's garden shed in Putney became the most advanced music studio in the world, housing 384 oscillators, as well as a collection of filters, noise generators, ring modulators, signal analysers and amplifiers built with the help of his college David Cockerall using ex-Army electrical components. The centre of the studio was the computer, running on 8k of memory priced at £1/byte (£8000) allowing thousands of musical parameters to be sequenced several thousand times a second. Throughout the 1960’s and 70’s Zinovieff’s studios housed a community of passing intellectuals, engineers, inventors and hippies, becoming a place of pilgrimage for musicians looking to discover previously unheard sounds; Peter's daughter Sofka recalls, "I’d be having tea in the kitchen with my two younger brothers, when people like David Bowie, Paul McCartney or Pink Floyd would pass by on their way to the studio". Other visitors included Kraftwerk, Klaus Schulze, King Crimson, Alan Sutcliffe, Hans Wener Henze and Karlheinz Stockhausen to name but a few. During 1966-67 Zinovieff worked closely with Delia Derbyshire and Brian Hodgson on their post-Workshop project 'Unit Delta Plus', together they attempted to create commercially viable sounds for TV, film and advertising without success, although Zinovieff admits "I didn't want to have a commercial studio, I wanted an experimental studio where good composers could work and not pay". In 1969 Zinovieff formed EMS (Electronic Music Studios Ltd.) with Tristram Cary and David Cockerell and together they developed the EMS VCS3, a portable analog synthesizer used on Pink Floyd's 'On The Run' and The Who's 'Won't Get Fooled Again' whilst becoming a staple of the studios of Brian Eno, Jean Michel Jarre and Todd Rundgren. The VCS3 and the subsequent Synthi 100 and Synthi series appeared with the tag-line ‘Every picnic/nun/school/band needs a Synthi’ and are still in use by Aphex Twin, Stereolab, Portishead and Panda Bear, with MGMT, Spectrum and Experimental Audio Research placing the VCS3 on several album sleeves. ‘Electronic Calendar’ begins with ‘Chronometer ‘71’ composed in the form of a graphical score by Harrison Birtwistle. The piece is comprised of recordings of Big Ben and Wells Clock which are sequenced by Zinovieff’s computer to a pre-determined structure controlling tape machines and their parameters in a system that resembles an early sampler. The piece was created in the second iteration of Zinovieff’s studio in the basement of 49 Deodar Road which he called ‘Musys’, inside this studio was the world’s first series of narrow filter bands that could be used as a sound analysis system, recording the response of each filter in relation to the applied signal: Zinovieff had created the world’s first vocoder. The second CD opens with Zinovieff’s interpretation of the Christian song of mass ‘Agnus Dei’, followed by ‘ZASP’, a collaboration with Alan Sutcliffe. In 1967 ‘ZASP’ won second prize at IFIP (International Federation for Information Processing) Congress, a society dedicated to computer arts, missing out on first place to Iannis Xenakis. The CD closes with the last piece of music recorded in the EMS studio before it was destroyed by a flood in London’s National Theatre in 1979. The piece is aptly titled ‘Now Is The Time To Say Goodbye’ and features interview fragments of Zinovieff fading in and out of view. 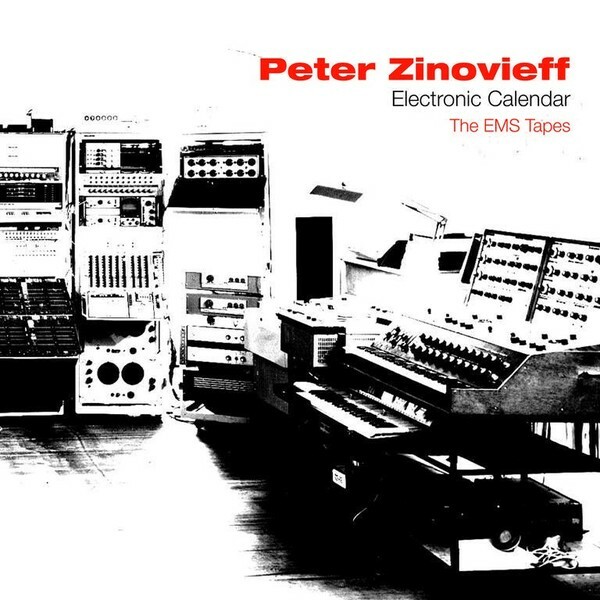 After a 35 year gap, Zinovieff has re-emerged following a commission from Russell Haswell, he continues to experiment with computer music theorising future innovations while proclaiming “computer music is only at the beginning”. ‘Electronic Calendar’ therefore serves as an essential preface to the history of electronic music from one of its most influential pioneers." Double CD Back In Stock.